There are so many great things we could say about Monica, but one thing that stands out is how much she has grown! Let's start at the beginning. Monica was referred to Goodwill's Extended Employment Program towards the end of her high school career. 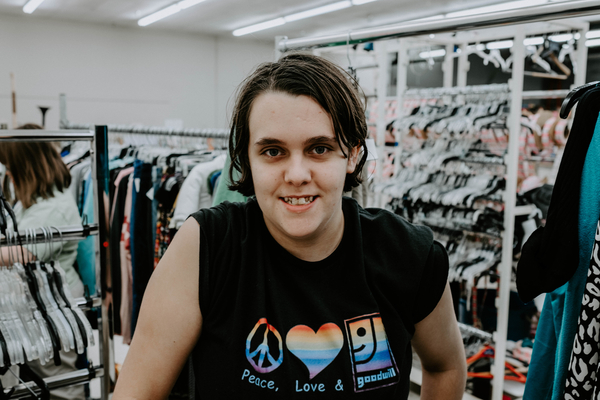 In May 2017, she earned a position on the Retail Support Team at Goodwill, helping organize donated clothing. This drastic change from high school student to employee took a toll on Monica. After one week, she became overwhelmed by the social and work aspects involved with starting a new job, and didn’t show up for work. After her coach and mother met to discuss what would be best, they decided working three days a week would be the perfect place for her to start. Spoiler alert: it definitely was! With a more accommodating schedule for Monica, she has grown in so many ways. She had struggled with learning the hanging order of clothing, but now she's got it down - she even works on the store floor pulling and stocking clothing. She struggled to get to know her co-workers, but now she is friends with all of them - and she even jokes around with them! And, Monica grew her job, too. She now works five days a week again. Barriers being knocked down left and right. We love it! "Monica has come such a long way. She has become a more assertive, self-confident and social young woman. Since she's been working, she gets to buy her own things, with her own money, and I think that's very empowering." New things can be difficult, but it's great to learn how Monica has overcome so many challenges. Hard work and determination truly pays off!